Article first published as Book Review: ‘A Search for Family’ by Murray Lee Eiland, Jr. on Blogcritics. 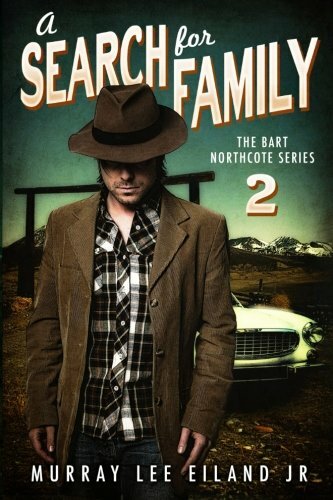 “A Search for Family” is the second book in The Bart Northcote Series by Murray Lee Eiland, Jr. Mark Martin is an aging Hollywood star, best known for his Western movies. Though surrounded by three of his lifetime friends, whom he considers his family, Matt is still lonely and doesn’t even want to consider that he might face his golden years alone. Matt hires private detective Bart Northcote to find his only child, born of a relationship that ended badly many years ago. Finding Matt’s daughter turns out to be a simple deed for the detective. After a fairly smooth reunion, Matt invites his daughter Ari, and her mother and old-flame Roxanna, to spend some time with him at his mansion before Ari has to leave for college in a few weeks. With a fresh outlook and renewed vigor, Matt’s life turns around as he relishes his new family. It’s not a completely idyllic homecoming as Matt’s old friends try to accept his new family, and when Ari is kidnapped and held for ransom, the relationships of everyone involved are pushed to new limits. Bart senses that someone in the family is responsible for the kidnapping, and this becomes even clearer when he is given explicit instructions to keep the matter in-house and not involve the FBI or the police. After hitting it off with Ari before her disappearance, Bart is even more invested in finding her safe. It’s a race against time when Bart realizes the kidnappers might be more interested in the permanent removal of Ari as a threat, and that paying the ransom will not guarantee happily ever after. I thoroughly enjoyed this story. I found it exceptionally entertaining, and the writing captured my attention and held it from the first page to the last. There is a certain lightness to the delivery that I found completely engaging. It is well crafted, full of mystery and intrigue, and enough twists and turns in the plot to keep you guessing long after you think you have it all figured out. But, it’s the characters that make the story in my opinion. Matt Martin, the aging Western superstar is endearing and charming, yet downright mean and intimidating when need be. Bart Northcote, the extremely talented and courageous PI, who also happens to be an author, is heroic and likeable, yet not perfect. There are the much-chagrined friends of Matt, who up until the appearance of the long lost daughter, were heirs to his fortune. The story is also filled with colorful support characters, such as police officer Bowen, who hires Bart to follow his wife, a well-endowed woman, named Honey Moons. A bit-part character I rather enjoyed is Bart’s agent, Jason Teague, whose philosophy is that “Books don’t get edited anymore, they get printed.” Hilarious. Period. Overall, I found “A Search for Family” by Murray Lee Eiland, Jr. to be a highly entertaining, fast-paced light mystery/thriller. Though this is the second book in The Bart Northcote Series, it definitely holds its own as a solid standalone story, and I look forward to the next installment. Great read.